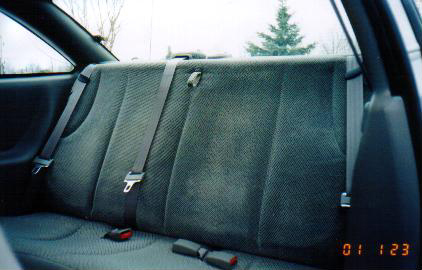 Note: In 2003, GM changed the back seat to a 60/40 split design and included a center shoulder belt so this article applies only to the 95-02 J-Body. This text was taken from Stuart's post on j-body.org. It's actually an easy mod to do. Remove rear side panels and rear seat....un-bolt the stock lap belt and bolt the new seatbelt to floorpan in same location. Because the new retracor sits about 1" above the rear shelf, you'll have to cut a hole out of the particle board.....i used new automotive upholstry material and re-covered mine with a "hump" to cover the new belt retractor. I went to the scrap yard and found a wrecked cavy. was able to get 1 of the rear seatbelt guide plates to finish off the opening where the belt goes into the retractor.